It’s a toss between this one and the UMi Plus E. We’d still prefer the latter because of the storage capacity and RAM. Shame about the lack of NFC but at least it won’t cost you an arm and a leg. 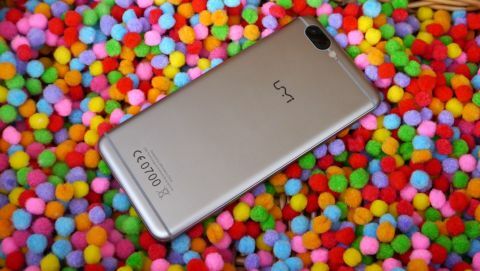 UMi (now rebranded as UMiDigi) is one of the better known mobile phone brands in China although not quite in the same league as the Xiaomi’s or the ZTE’s of this world. The UMi Z is the second UMi smartphone we’re reviewing after the mind-boggling UMi Plus E, a phone that carries 6GB of memory and 64GB of storage. The Z is actually in the same price range, currently retailing for about £205 at Gearbest - the online retailer which provided us with the review sample - compared to £220 for its bigger brother. UMiDigi doesn’t make it particularly easier to distinguish between the top of the range models and the mainstream ones. The UMi Z Pro for example is very similar to the Z and earns the “Pro” moniker simply because of a different image sensor. Note that this price is exclusive of any taxes that may be levied by HMRC or the courier companies on behalf of the vendor. It is difficult not to think of the Apple iPhone range when contemplating the UMi Z. The engineers opted for a machined, single space-grade aluminium block for the chassis with a gun-metal finish which mimics the design of Apple’s smartphone range. The device is also available in a gold champagne finish. Plenty of rounded edges on that one, similar to what we saw on the UMi Plus E and commonly labelled as 2.5D Arc by the competition; There’s a single fingerprint button on the front that doubles as a home button; long pressing it brings up three capacitive buttons on the screen but you can always change that in the settings. The screen occupies most of the front facia - which translates into millimeter thick bezels - with a front facing camera, LED status light and a speaker. The audio socket is located on the top edge; the volume rocker and the power button on one side and the SIM/microSD card tray on the other. The bottom edge hosts two speaker grills and a USB Type-C connector. Flip it on its front to reveal a camera with a quad-LED flash, UMi’s logo as well as the usual CE description. For a smartphone with a 5.5-inch display, the UMi Z is fairly bulky (152 x 76 x 8mm) and heavy (172g), not necessarily a bad thing. It doesn’t exhibit any noticeable flex and all in all, the mobile does have a premium feel, clearly punching above its weight. At the heart of the UMi Z is the Mediatek Helio X27, a 10-core system-on-a-chip with three CPU clusters (two A53 and one A72), the latter is clocked at up to 2.6GHz. The graphics side is handled by an ARM Mali-T880 MP4 4-core GPU clocked at 875MHz. As expected the device handles all the major LTE categories (including the all important B20) and most connectivity radios (Bluetooth 4.1, 802.11ac Wi-Fi, GPS, GLONASS). It is a shame that it doesn’t handle two SIM cards (one LTE, one 3G) and one microSD card at the same time, forcing the user to choose between storage and the flexibility of having two cards. With 4GB of RAM onboard and 32GB storage, both from Samsung, the Z slots firmly in the mainstream market; the Plus E is far ahead though, offering respectively 50% and 100% more in terms of memory and storage, for a small premium. The display is a gorgeous Sharp-sourced IGZO full HD display with a 5.5-inch diagonal. It exhibits all the traits of a great screen: vibrant, crisp colours, readable even in broad daylight and integrating MiraVision and ClearMotion technologies. There are two 13-megapixels cameras on the UMi Z, both are Samsung-made, the S5K3L8, and feature laser and PDAF focus technologies with enhanced performance in low-light condition. The onboard battery is a 3,780mAh battery from Sony which, according to the manufacturer, can power the device for up to two days and takes only 30 minutes charging to reach 50% capacity thanks to the PE+ Quick Charge technology. That’s made possible thanks to the USB Type-C connector and a 15W (12V, 1.25A) charger. As expected, this smartphone comes with Android 6 in its stock version and the vendor confirmed that plans to bring Android 7.0 over the air. To call the UMi Z a speedy smartphone is a serious understatement. This thing flies; during the short time we spent with it, it was clear that the combination of fast processor cores, generous amounts of memory and storage translates into a fluid, seamless, beyond-reproach mobile experience. The fact that it uses stock Android means that updates, in theory, should come faster as well, which happened when we did this short review. What should business make of the UMi Z; well, it is a fine smartphone but has to make do with a very crowded market dominated by the likes of Lenovo (with the likes of the ZUK Z2) and Xiaomi. It doesn’t come across as a very business focused smartphone although a superb finish, fast charging, dual-SIM capabilities and a fingerprint reader make it a great fit for anyone looking for one. Our closing comments for the UMi Z will mirror what we said about the UMi Plus E. You will be taking a punt with the company since it is a relative newcomer and doesn’t have the sort of international recognition or support network as some of its bigger competitors. But then in a world where smartphones with high end features are becoming far more affordable (and disposable), the idea of owning a top-of-the-range smartphone for only 12 months doesn’t seem particularly alien.